Last year, Fredrik and I were touring the northern parts of Sweden and took the opportunity to go to Malå to visit the company Hultdins. They are one of many examples of Swedish export companies with an innovative, leading technology which has gathered a large chunk of the market in many countries. Hultdins celebrate 90 years this year. The company was established in 1928 by carpenter Waldemar Hultdin who opened a smith shop to build horse equipment in Aspliden, far up north in Sweden. 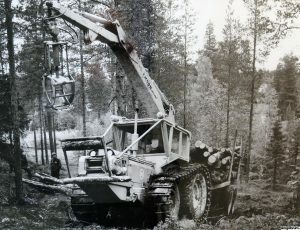 His sons, Gustav and Ove, joined the company and in the early 50’s Hultdins began manufacturing forest equipment for agricultural tractors such as roof-mounted cranes and semi tracks. 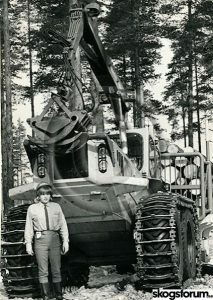 In 1963 the company had grown to such extent that it was decided to move the entire business to Malå, where it is still located today. 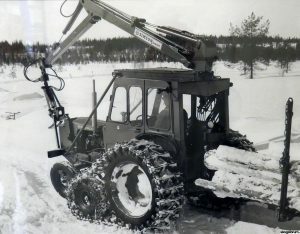 In 1965 they started building the so called “Partraktor” (a tandem tractor configuration with two tractors) together with the local Nuffield dealer. What was special about this new tractor was that it had two engines side by side, one for each set of wheels. One engine powered the wheels on the right side, the other the left. To turn, the rotation speed of the engines was regulated. The pair tractor was, however, not approved by the authorities to be used for road transportation and the project died out. Together with the local Nuffield dealer, Hultdins tried to build a ny tractor out of two. Mounted side by side with two engines. Instead, from 1970, Hultdins operated as suppliers within the mechanical and mine industry. A few new products were developed parallel to other business aspects and in 1980 the company made a decisive strategic decision to focus solely on their own products. It was also decided that the products were supposed to be products needed to perform crane-based work – “crane tip products”. 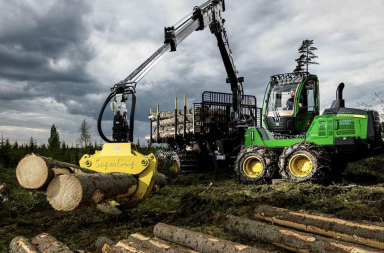 Today, 35 years later, Hultdins can boast a portfolio of products, all of which are instrumental components in today’s modern forest and construction machines. 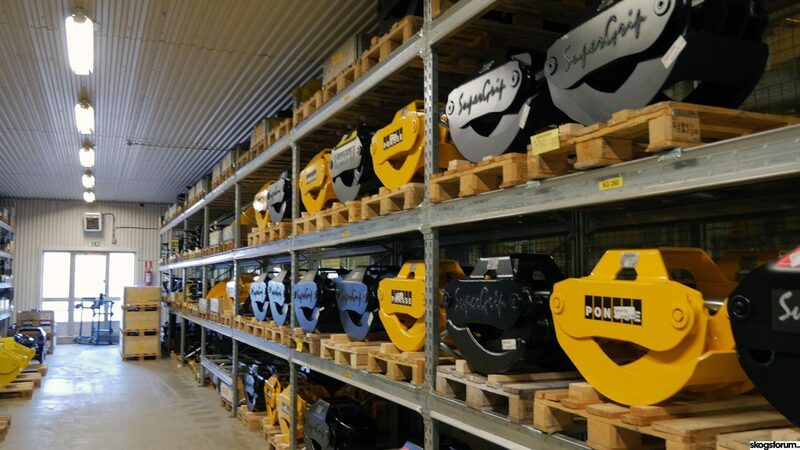 In terms of grips and sawing units, Hultdins has a very strong market position not only in Sweden but worldwide. According to the company, every second tree cut down in the world is cut by a unit which uses the Super Cut, and the Super Grip is the timber grip used by most entrepreneurs. Hultdins exports their products to 35 countries and has a sales company in North America known as Hultdins Inc. The mother company, Hultdins System AB as it’s formally known, has a turnover of 158 million SEK (19,2 miljon US$) in 2017 and 68 employees. The wedling robots works with high precision. 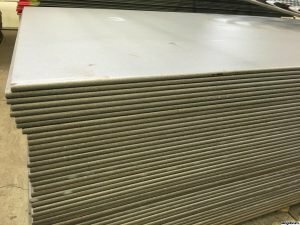 All holes are drilled before welding the pieces together and perfectly aligned in the finsihed product. It’s late afternoon as we visit the factory in Malå and part of the work has already ended for the day. 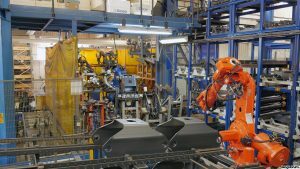 A few welding robots are, however, still working hard and it’s interesting to see how steel plates and steel pipes, from the inlet on one side of the facility, quickly transform to finished and highly advanced products through modern machinery and automated processes. From rough steel plates and steel bars in one end of the plant grapples for the whole world are produced. There are two production lines for grips: one for Super Grip and one for Super Grip II. 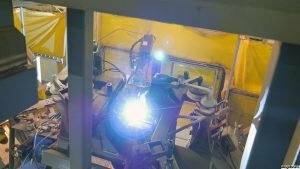 The line that produces the II-series has a higher level of atomization than the other, though both have robots handling most of the welding and processing. The precision is very high which means that despite holes for fitting being drilled before the grip’s steel parts are welded together, the holes are located and aligned exactly where they should be once the assembly is complete. 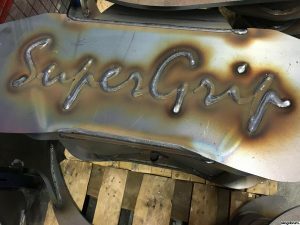 The welding robot that stitches the Super Grips together finishes the job with a characteristic signature: “SuperGrip”. The robot that is welding Super Grip II lacks the same writing abilities, though, and those grips are labelled with stickers. One of Hultdins weldling robots has a nice handwriting. It signs every grapple it makes. 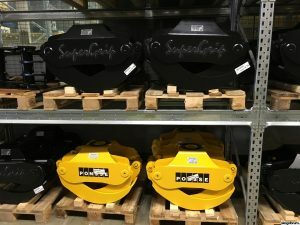 Once the grips have passed the paintwork section, most are Hultdins black, however some are customized for the customer such as John Deere or Ponsse yellow. Hultdins make grapples for many OEMs. 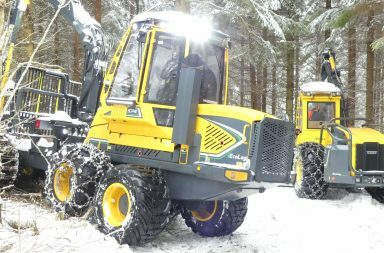 Here som grapples in John Deere yellow. An interesting product is the so-called A-grip. 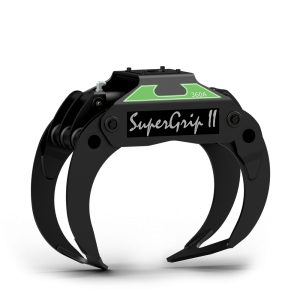 A Super Grip II with angled armes which is meant to improve the gripping ability. 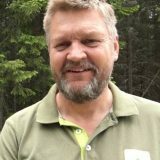 According to attempts made by SkogForsk (a Swedish forest research institute) productivity is increased both during loading and unloading by up to 7% compared to a traditional grip. 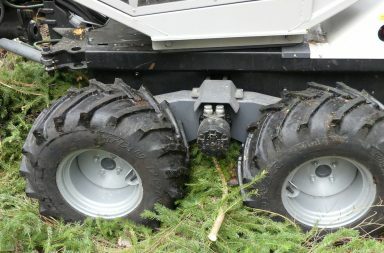 Hultdins also claims that the A-grip provides considerably more effective loading of slash/harvesting residues and when loading in steep terrain. When the A-grip was launched it has a few initial issues which may have prevented it from being given the chance it deserved. But since the launch several years ago the A-grip has evolved in quality as well as geometry. The grips have gotten a rounder shape and today there are no issues with durability, according to Hultdins. 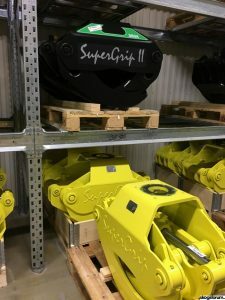 The market share is now slowly growing for the A-grips and according to the company it appears those who have tried the A-grip in the field are never going to switch back. Hultdins A-grip has angle shaped armes for better precision in the loading and unloading work. Here is a video from our visit at the Hultdins manufacturing plant i Malå.